Identity attacks have increased by 300% in the last year. To protect our customers from these ever-increasing attacks, Microsoft is embarking on a journey to rollout baseline protection. To that end, I’m excited to announce today the public preview of the first baseline policy to protect privileged Azure AD accounts. During the public preview phase, we’ve made it easy for you to opt into the baseline policy with a “one-click” experience. After general availability, we’re going to opt you into the policy by default but provide you the configuration to opt out at any time. We highly recommend you opt into the policy immediately. 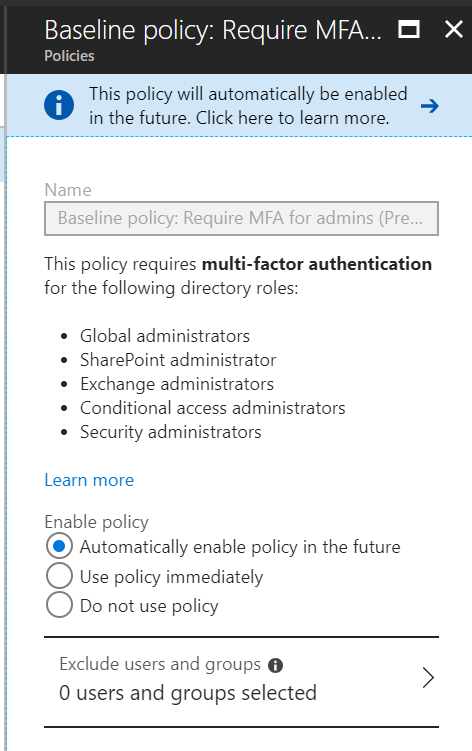 To verify your baseline policy is set to go, sign in with one of the accounts in the directory role. You should see an MFA prompt. Don’t forget to review the FAQ section to learn more about this new feature. As always, we want to hear your feedback! Please let us know what you think of this new policy and how it’s working for you. We’re listening!